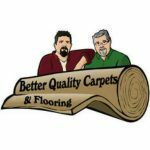 Better Quality Carpets and Floors makes getting beautiful new floors easy. Better Quality Carpets and Floors makes getting beautiful new floors easy. Free shop at home service. Mill direct pricing on all carpet, hardwood, laminate and vinyl. We can even install next day.